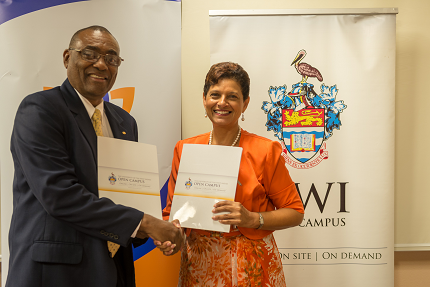 The UWI Open Campus, Barbados W.I., August 14, 2018 – The University of the West Indies (UWI) Open Campus and The Caribbean Institute of Certified Management Consultants (CICMC), signed a formal Memorandum of Understanding (MOU) on Tuesday, August 14, 2018. The agreement which was signed by the Pro Vice-Chancellor and Principal of The UWI Open Campus, Dr. Luz Longsworth and President of the CICMC, Mr. Donald Demeritte provides collaboration in areas such as: regional capacity building utilising the skills of Management Consultants to assist with specialised projects and joint ventures, organizational development initiatives, public education workshops and webinars and technical assistance, where practicable in harnessing the experience and resources of both organizations. In her remarks about the partnership with the Caribbean Institute of Certified Management Consultants (CICMC). Dr. Luz Longsworth, Pro Vice-Chancellor and Principal of the Open Campus, stated, "The University of the West Indies Open Campus is committed to its partnership with The Caribbean Institute of Certified Management Consultants. This MOU reflects The UWI’s Triple A Strategy (2017-2022) Revitalizing Caribbean Development which is conceived within the continuing context of sustained public service and persistent institutional excellence and endurance. The UWI’s aim to propel the people of the region along a progressive and prosperous path is both the University’s intention and its mission. The UWI Open Campus is committed to capacity development of the Caribbean and, in partnership with CICMC, to advancing The UWI’s vision for regional viability in economic development relevance and sustainability. We are pleased and excited about the potential of pooling our institutional capacity development in this Open Campus CICMC partnership." Dr. Luz Longsworth, Pro Vice-Chancellor and Principal of The UWI Open Campus and Mr. Donald Demeritte, President, CICMC (The Bahamas) sealing the agreement with a hand shake after the signing ceremony. 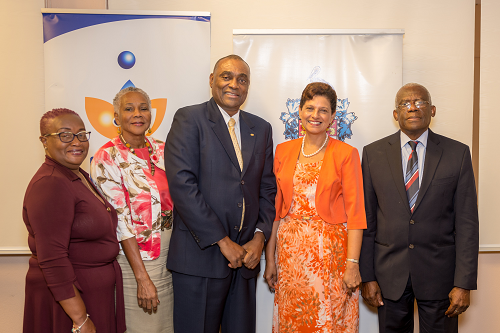 Dr. Luz Longsworth, Pro Vice-Chancellor and Principal of The UWI Open Campus and Mr. Donald Demeritte, President, CICMC - The Bahamas (centre) – sharing lens with other members of the CICMC from (l-r) Ms Juliette Feliciano - Administrator, CICMC Secretariat (Barbados), Mrs. Norma Shorey-Bryan - President, CICMC (Barbados) Chapter and Mr. Olson Robertson, Regional Director, CICMC (Barbados) after the signing ceremony. 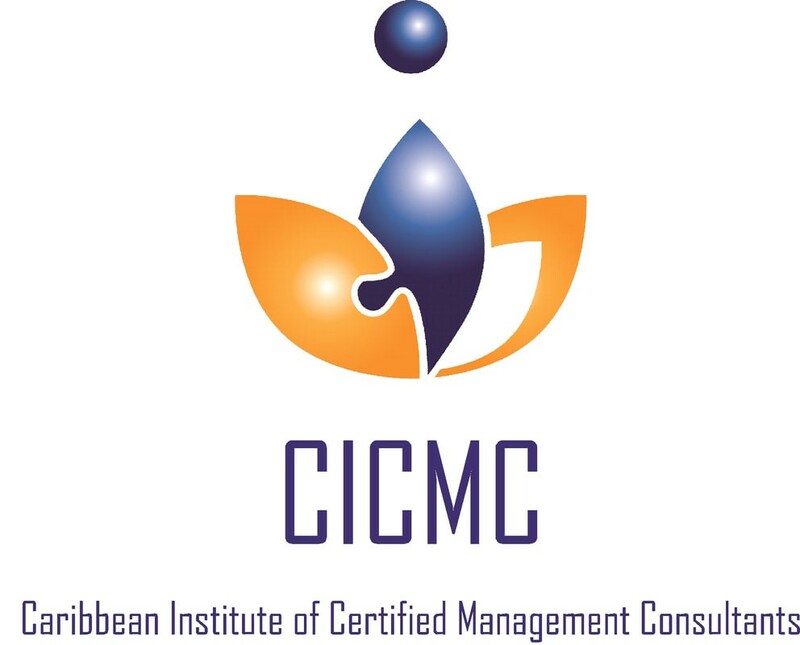 The Caribbean Institution of Certified Management Consultants (CICMC) is the official representative body for Certified Management Consultants. The CICMC was established in 2007, as a non-profit organisation to regulate the practice of management consultancy, to advocate for the profession and to advance the effectiveness of management consulting practices and processes in the region. Since its inception and with the institutional support of the Caribbean Export Development Agency and other regional stakeholders, CICMC has expanded its influence throughout the CARIFORUM region and is now regarded as a champion of advocacy, network support, capacity development and education for regional consulting professionals. The CICMC facilitates members’ certification in management consulting, i.e. Certified Management Consultant (CMC) along with other ongoing education courses and is affiliated with the International Council of Certified Management Consultants network globally.